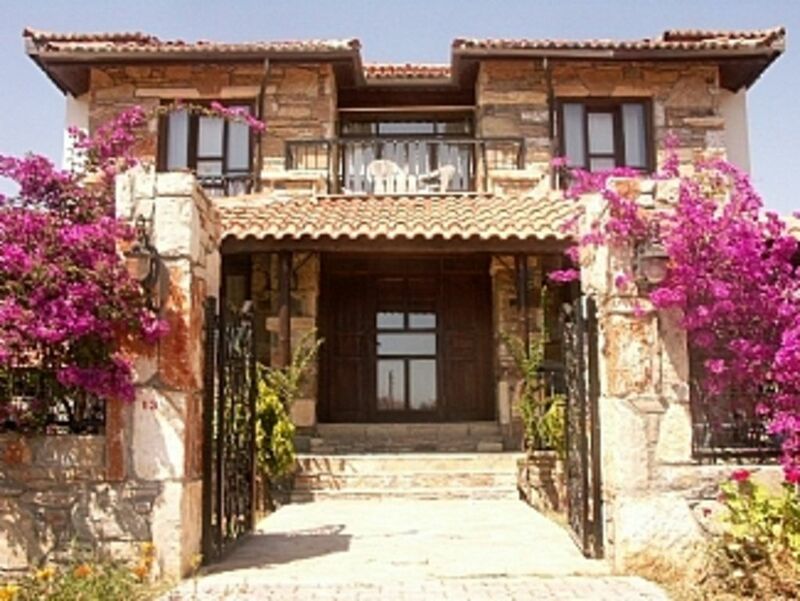 Free Wifi , Villa Vita, Dalyan,Sleep 6 ,3 Bedrooms , Pool. We immediately fell in love with the area, Dalyan has something for everyone, beautiful environment, friendly local people & lots to do & everyone who goes seems to love it, & makes a rtn journey at some time later,they say once you been its like a elastic band! you will always want to come back & relive & share your experiences with your love ones, friends & family. Area to village, 10 mins walk where all the shops bars & restaurants are, Dalyan is extremely safe & relaxed village with a great atmosphere. En-suite Shower /bathroom with master bedroom and bath. Plus toilet /shower room on same floor. Plus shower room toilet in basement . Plus outdoor pool shower. Total of 4 showers 3 toilets 1 bath. Car port gate with secure padlock. WI-FI Sky tv. dvd, radio, coffee table, books, mags, main dining table, .Also there a breakfast table area by the kitchen for family /children . hob/ stove & Grill fridge, freezer, microwave, dishwasher and all mod cons.sandwich/toaster, fruit juice maker, kettle ample cooking utensils,coffee maker ,combie over. Notes on accommodation: 3 bedroom (sleeps 6 people) the Villa. local,boat trips etc A modern deluxe villa in Beautiful rural location yet only a 7 minute stroll into the town centre & bars. Villa was completed April 2008- 2015 & has 3 bedrooms master on-suite fully air-conditioned in all rooms.. Hair dryers for your use. Outside: The villa stands in fully enclosed large gardens which are planted with an abundance of lemon, orange and grapefruit trees, grape vine and many other mature flowering shrubs and trees. There is a spacious marble terrace off the living room with a built in barbeque. There is a further patio area to the rear of the garden. An outside table with chairs and 6 sun loungers with cushions are provided. The private pool is a good size and there is a separate pool for small children. Utility Room: Bosch washing machine, iron and board, pegs, airer, miscellaneous cleaning materials, etc. Cleaning / Towels / Linen/ The villa will be thoroughly cleaned and prepared for your arrival. l white cotton bed linen and house towels are provided for your stay. pool and garden high standard. Dear Mike & Patsy, Just wanted to let you know what a fantastic time we all had staying at Villa Vita! 2 weeks of fantastic weather, the Villa and Pool are superb, as are all the other facilities provided. Dalyan is such a wonderful resort, great people, great restaurants and so cheap! Local beach is 20 mins from Dalyan by local bus (which run all day to and from beach). Famous Turtle beach (Iztuzu Beach). Famous Dalyan mud baths and Natural Thermal Springs which have healing powers or from Dalyan river side you can go by boat to the beach which is a nice enjoyable way to go then afterwards back to dalyan & enjoy a riverside super Lunch at the different restaurants along the river front.& watch the boats & people go by!! breathtaking because we have done this many times. or any help needed while there. 10 min walk to Dalyan village centre or 4 mins by taxi to the Riverside. The World famous Turtle Beach sands is 20 mins away. 30 mins to Dalaman town centre, or Ortaca market/local town market is 20 mins by local domus which has more shops.& local market day. There is a reference book in the villa which will provide further information about the villa and the amenities in Dalyan. For more photos of the villa + video of Dalyan copy the link below into your browser. or see, You Tube. Dalyan villa vita video. bles are ‘to die for’ and this is reflected in the Turkish cuisine. There are enough good restaurants in Dalyan to eat at a different one each evening for two months, and still have some to visit! Turkey has a wonderful summer climate, and extremely pleasant temperatures from early spring until well beyond autumn. There is a cooling breeze, often running between the inland lake and the sea in Dalyan, but it is unwise not to take high factor protection against the sun. Please ensure you have valid passports for everyone in your party, and check that each passport will be valid for at least six months after your scheduled return date. Normal European Adapters can be used for your electricals – the voltage is 220volts AC, and Villa Vita has 4 of these. Please can you leave these behind for the following guests.